The Agilis Ku Band to L/IF Downconverter provides a broadcast quality solution for teleport and earth stations who use a hybrid of IF (70MHz or 140MHz) and L Band equipment to provide telephony services. The Agilis Ku Band to L/IF Downconverter accepts a frequency input of 10.7-12.75GHz making it compatible with wideband FSS and BSS Ku Band satellites. The Agilis Ku Band to L/IF Downconverter provides a broadcast quality solution for teleport and earth stations who use a hybrid of IF (70MHz or 140MHz) and L Band equipment to provide telephony services. The Agilis Ku Band to L/IF Downconverter accepts a frequency input of 10.7-12.75GHz making it compatible with wideband BSS and FSS Ku Band satellites. 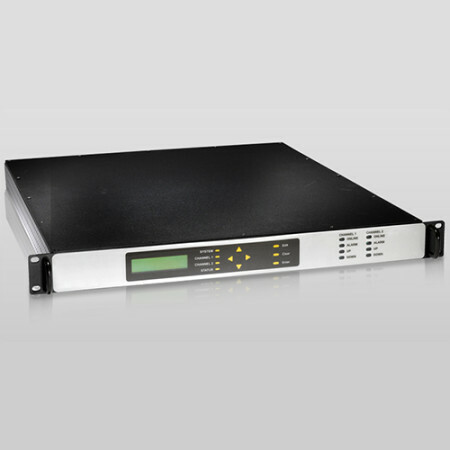 The Agilis Ku Band to L/IF Downconverter is rack mounted and is powered by a 100-240VAC internal power supply. The unit can be controlled via RS232/485 with external monitoring provided through SNMP.